We have a new selection of Christmas Craft Kits in the Seasonal & Holiday Kits section of the store. 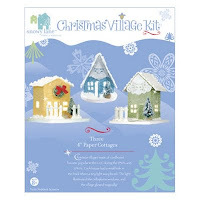 Create a traditional Christmas Village with paper craft kits from Snowy Lane Crafts! 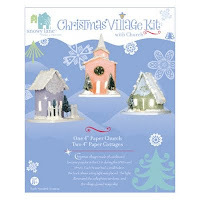 The Christmas Village Kit includes all the materials you need, including printed house templates, foam core bases, a sheet of frosted paper for the windows & doors, and more! 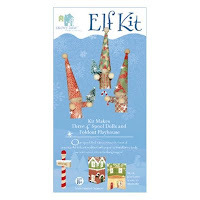 Each paper village kit also includes miniature trees, wreath, fence, ribbon, paper lace, glitter, snow, and glue! The only tool you'll need to have on hand is a pair of scissors. A detailed instruction sheet will take you step-by-step through the assembly process. There are enough supplies to make three sturdy 4-inch cottages with accessories. The Christmas Village with Church Kit make two 4-inch cottages and one 4-inch church. The foam core bases will give your paper cottages a firmly built structure. Your completed village will be sturdy enough to enjoy for many holiday seasons! This is an ideal holiday craft kit for the whole family to participate in together. It's recommended for adults and children 8 years and up. Younger children can also get involved with adult supervision. Create traditional wooden spool dolls with this Christmas folk art craft kit from Snowy Lane Crafts! The Elf Spool Dolls Kit is a fun craft kit with enough materials to make three 4" wooden spool dolls and one easy-to-assemble foldout playhouse. Kit includes wooden spools, beads, paper embellishments, accessories, glue, glitter, and detailed instructions. Invite your friends over for a holiday craft party! Crafting is a creative way to share time with family & friends. Explore creative holiday kits at Weekend Kits and be ready to make a charming Christmas village on your next Weekend at Home!